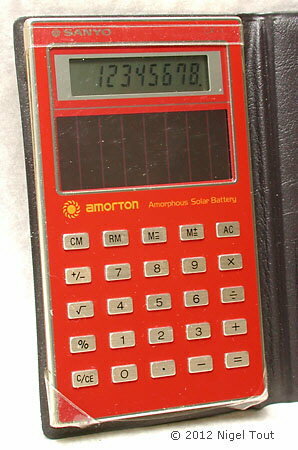 Distinctive features: An early solar cell powered calculator, with a more efficient "Amorton" amorphous silicon solar cell, which was developed by Sanyo. Size: (slightly bigger than a credit card). Sanyo, on its website, says about the "Amorton" amorphous silicon solar cell: "Unlike crystal silicon, in which atomic arrangements are regular, amorphous silicon features irregular atomic arrangements ... . As a result, the reciprocal action between photons and silicon atoms occurs more frequently in amorphous silicon than in crystal silicon, allowing much more light to be absorbed." Sanyo Electric Co. Ltd., corporate history, web page.